Your Jamaican Tour Guide has been added to your itinerary. 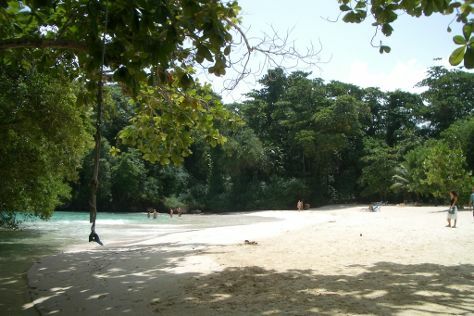 Take a break from the city and head to Doctor's Cave Beach and Original Mayfield Falls Jamaica. Do your shopping at Ahhh...Ras Natango Gallery and Garden and Jewels In Paradise. Spend the 8th (Fri) wandering through the wild on a nature and wildlife tour. There's much more to do: contemplate the long history of Rose Hall Great House, tee off at Cinnamon Hill Golf Course, and buy something for everyone on your list at Whitter Village Shopping Mall. For traveler tips, other places to visit, and more tourist information, use the Montego Bay attractions planner . Rio de Janeiro, Brazil to Montego Bay is an approximately 16.5-hour flight. The time zone changes from Brasilia Time to Eastern Standard Time, which is usually a -2 hour difference. Expect a daytime high around 35°C in February, and nighttime lows around 26°C. Finish up your sightseeing early on the 9th (Sat) so you can go by car to Negril. Start off your visit on the 10th (Sun): tour the pleasant surroundings at Bloody Bay and then tour the pleasant surroundings at Seven Mile Beach. Here are some ideas for day two: explore the striking landscape at Negril Cliffs, fulfill a lifelong dream with a swim-with-the-dolphins experience, and then stop by Irie Art. To see other places to visit, more things to do, maps, and more tourist information, refer to the Negril route planner. Drive from Montego Bay to Negril in 1.5 hours. Alternatively, you can take a bus. In February, plan for daily highs up to 35°C, and evening lows to 26°C. Finish your sightseeing early on the 11th (Mon) to allow enough time to drive to Ocho Rios. Head to Harmony Hall Jamaica and Wassi Artfor some retail therapy. Step out of the city life by going to Dunn's River Falls and Park and Horseback Riding Tours. The adventure continues: admire the sheer force of Blue Hole, surround yourself with nature on a nature and wildlife tour, take in the architecture and atmosphere at Our Lady of Fatima Catholic Church, and relax and float downstream with a rafting and tubing tour. For other places to visit, traveler tips, maps, and tourist information, read Ocho Rios trip itinerary planner . You can drive from Negril to Ocho Rios in 3 hours. Another option is to take a bus. In February, daily temperatures in Ocho Rios can reach 36°C, while at night they dip to 26°C. Wrap up your sightseeing on the 15th (Fri) to allow time to drive to Port Antonio. Visit Frenchman's Cove and Winifred Beach for some beach relaxation. Get outdoors at Reach Falls and Boston Beach. There's lots more to do: explore the activities along Blue Lagoon, pick up some local products at Boston Jerk Centre, and contemplate in the serene atmosphere at Portland Parish Church. To find maps, where to stay, ratings, and other tourist information, you can read our Port Antonio trip planner . Traveling by car from Ocho Rios to Port Antonio takes 2 hours. Alternatively, you can take a bus. In February, plan for daily highs up to 36°C, and evening lows to 26°C. Finish your sightseeing early on the 18th (Mon) to allow enough time to travel back home.